News & Trends> Product Trends > Industrial machines and equipment > Belt Conveyor Oven quickly dries coatings. 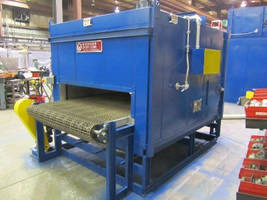 Belt Conveyor Oven quickly dries coatings. 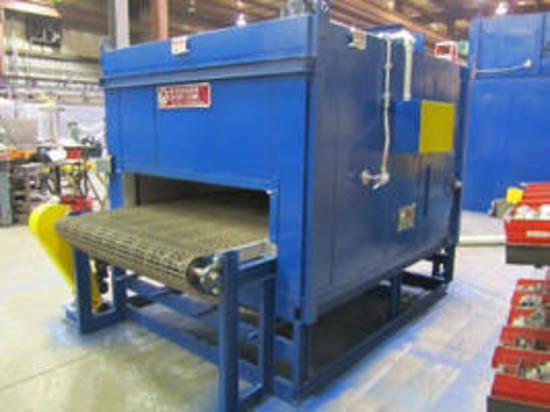 East Troy, WI – Wisconsin Oven Corporation announced the shipment of an electrically heated belt conveyor oven that quickly dries a coating on titanium and stainless steel fasteners. The industrial conveyor oven features a stainless steel wire mesh belt and processes the fasteners at a rate of 1,300 parts per hour. Wisconsin Oven designed the belt conveyor oven with a small footprint to maximize the customer’s floor space. equipment. Wisconsin Oven realizes that the success of the company depends on their Championship team of employees, which is why they have developed a company culture that recognizes and rewards employees. The goal at Wisconsin Oven is to outperform competition and provide customers with outstanding products and service. Featuring stainless steel wire mesh belt, electrically heated Belt Conveyor Oven dries coating on fasteners at rate of 1,300 parts/hr. Oven has max temperature rating of 400°F and 4 ft 6 in. x 7 ft 3 in. x 6 in. work chamber. Utilizing 6,000 cfm at 7 ½ hp belt driven blower and top-down airflow, recirculation system maximizes heating rates and temperature uniformity. Other features include variable speed drive for conveyor, SSR heater control, and digital recorder for chamber temperature.